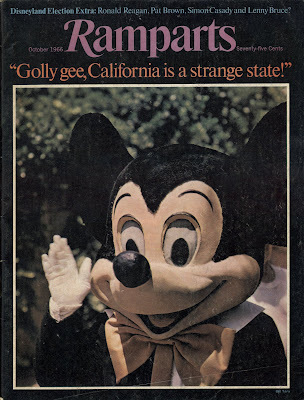 As you can tell by contents and “Apologia” column this publication probably wasn’t too interested in Disneyland. 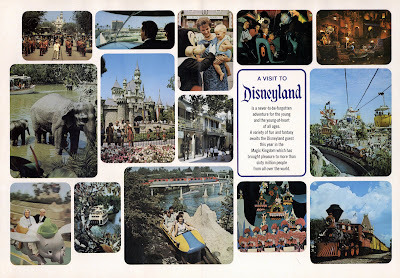 In Warren Hinckle’s column he explains how Disneyland was used to illustrate “California’s complex garden of politics”. 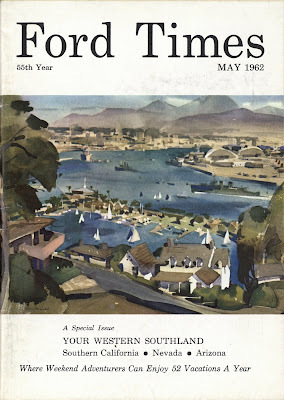 Contact me if you have an interest in the other articles in this magazine, I'd be happy to scan them for you. 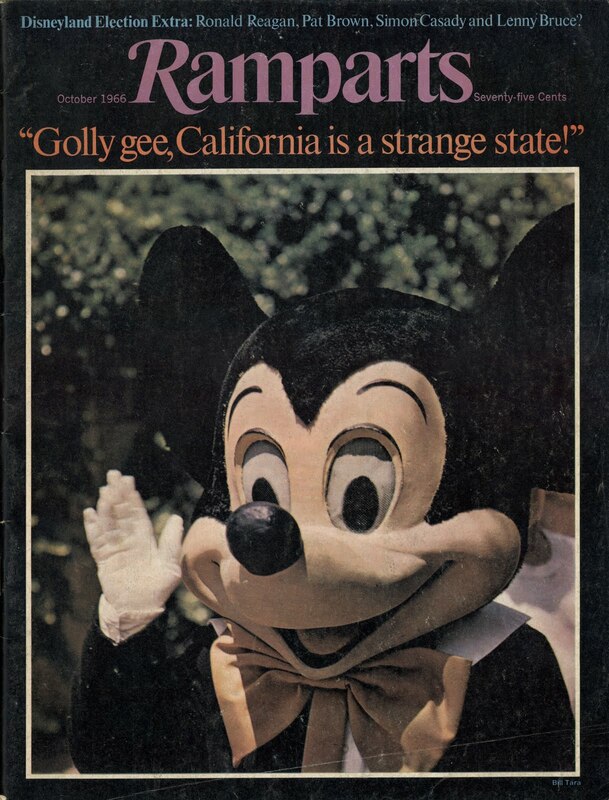 The article is broken up into “Lands”: Pat Brown in Liberal-land, Si Casady in Adentureland, Ronnie (Reagan) in Tomorrowland and lastly, Vultureland! Is this photo taken in New Orleans Square, if so, where??? Nice depth of field, I don’t suppose my cheap digital camera can do this? 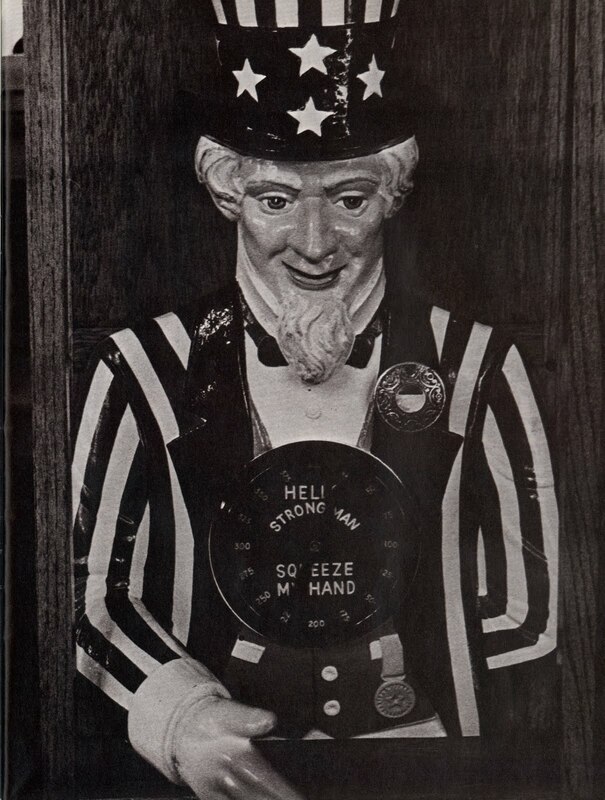 Is Uncle Sam still in the Penny Arcade? 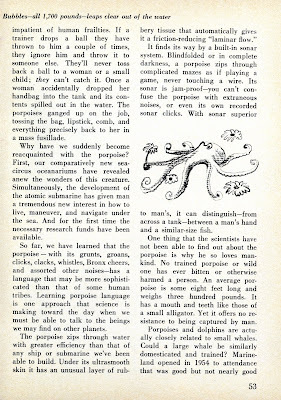 Oh man, I should know this! 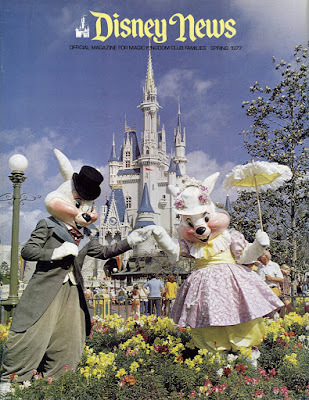 What on earth is going on here? 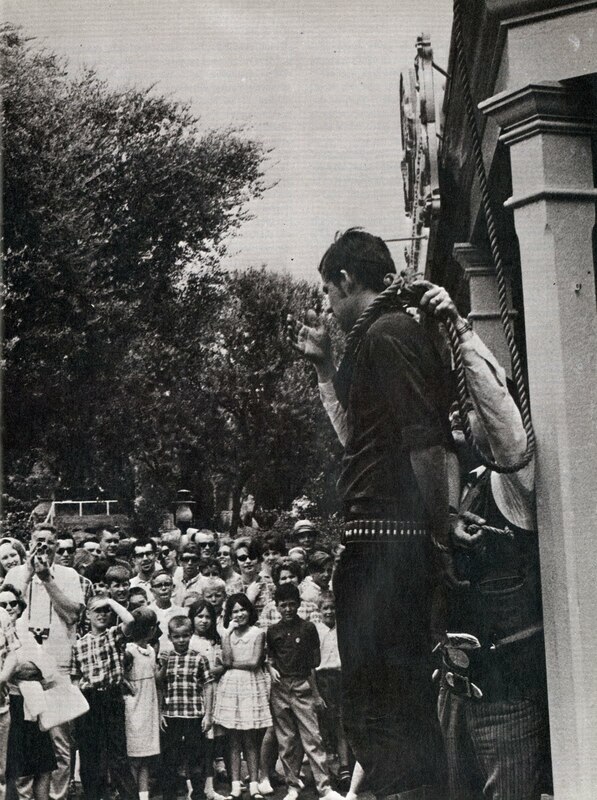 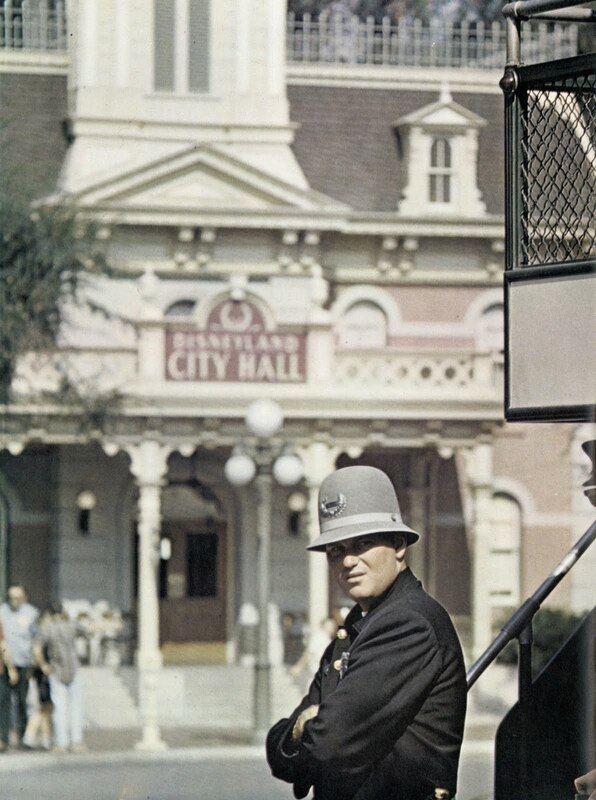 I know they used to do simulated hangings at Knott’s, but I never knew they did this odd ritual at Disneyland too? Is a hanging really appropriate in a political article? If this photo was in color maybe we could tell that It's a Small World was brand new. 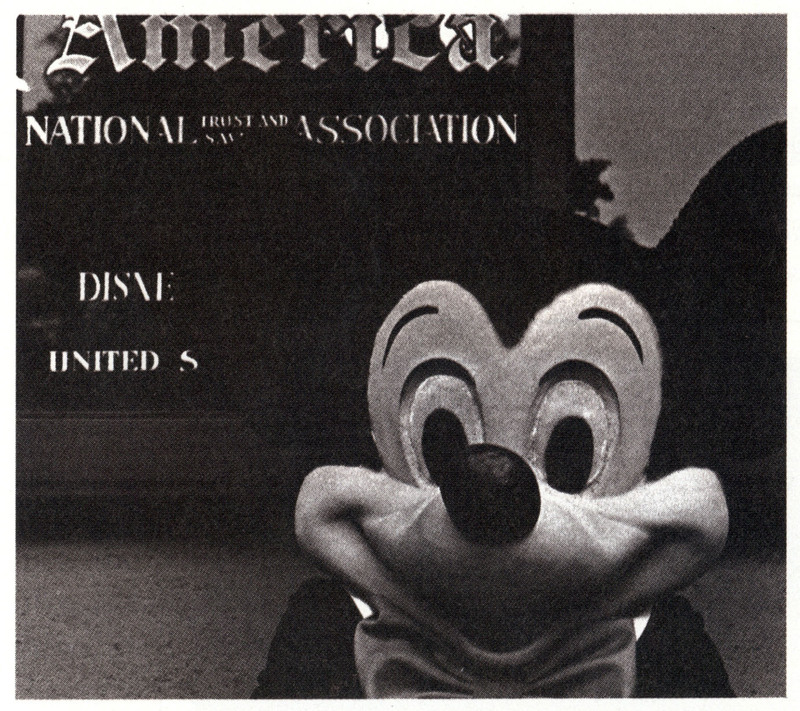 Mickey in front of the Disney Galley, oh, I mean the Bank of America. 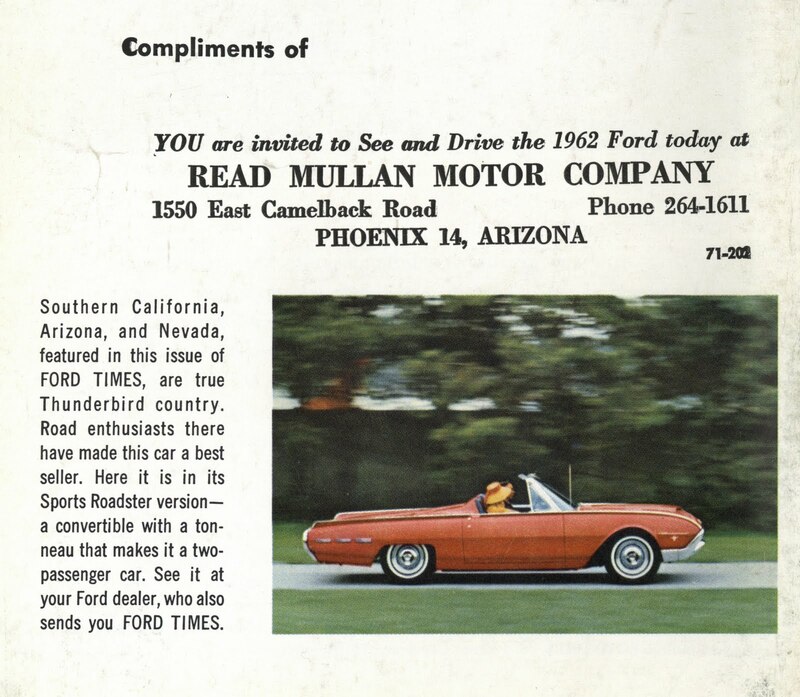 I could only find two full page advertisements in this magazine. This one is for shirts and has some pretty lofty ad text – it’s just a shirt Ok.
Not much to say about this since I know nothing about it. 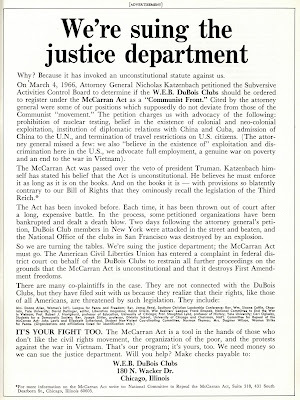 I wonder how that whole “suing the government” thing worked out? 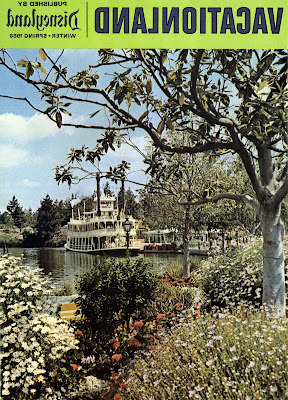 Welcome to Bonus Sunday. I hope everyone had a great Thanksgiving and had plenty of good food, I sure did! 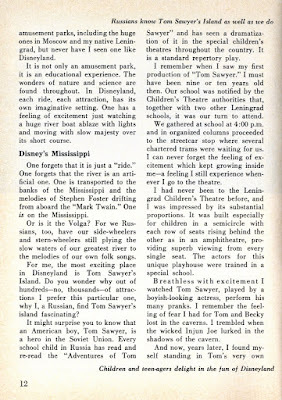 From Friday's post, here is the complete Winter-Spring 1968 edition of Vacationland. To be honest, I just noticed this photo was backwards when I scanned it the other night, but I've had this issue for a while and have read it several times! A nice two page Tiki Room article. Super color photos in the centerfold. 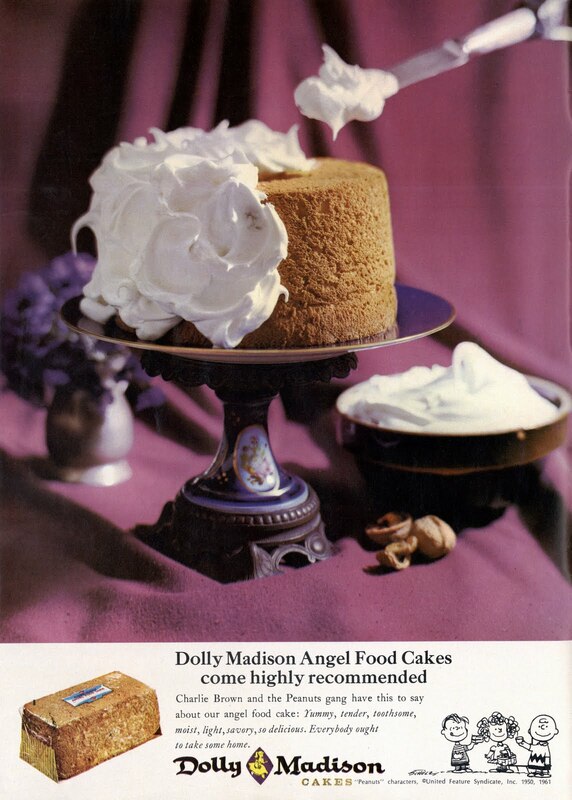 While not as exciting as a sack of sugar on a drinking fountain, I do like this ad for Dolly Madison Cakes, they're "toothsome". The purple ink they used is so thick it actually coats/laminates the paper! 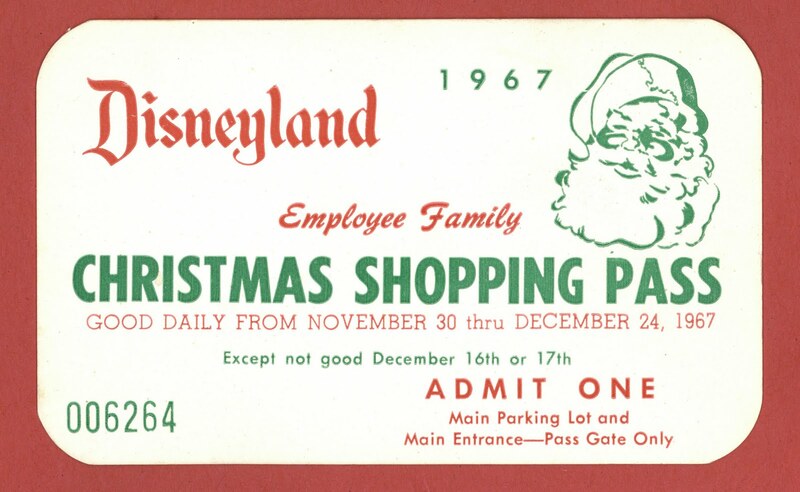 In honor of “Black Friday” here’s a vintage Disneyland Employee Family Christmas Shopping Pass from 1967. 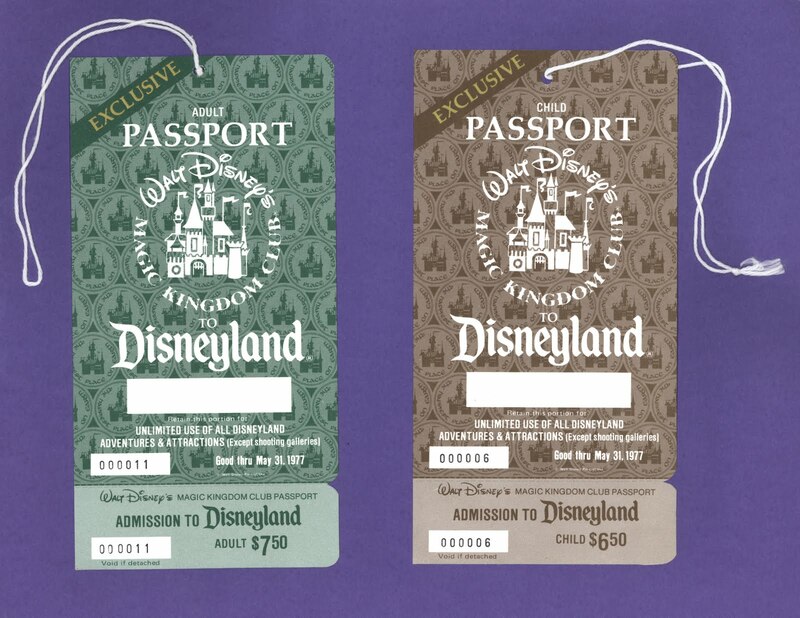 What a great treat for the family, free parking and a main gate pass good for most of December! 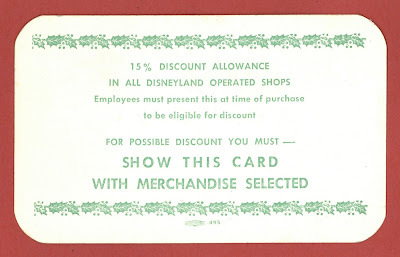 A 15% discount was “possible” on “selected” merchandise; of course the item you want is not “selected” and will be full price. See a 1981 vs. 1982 Employee Holiday Pass post from last year here (link). 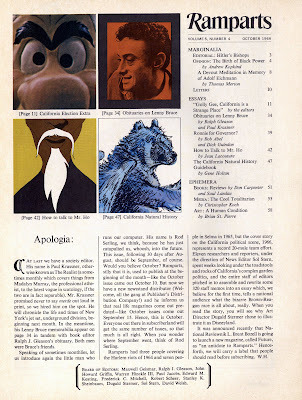 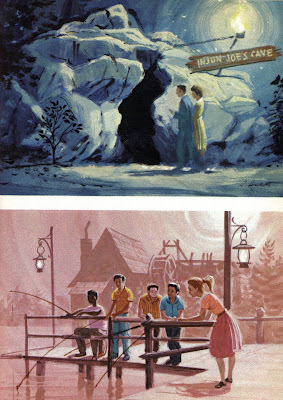 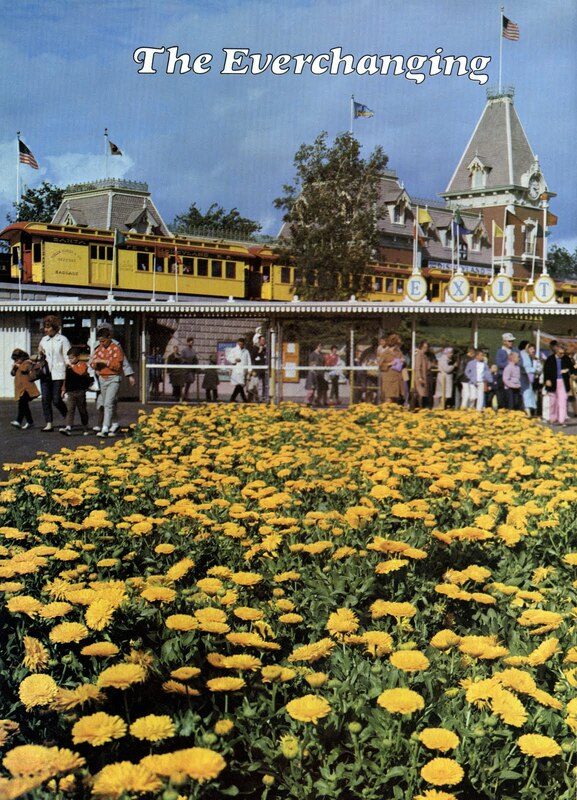 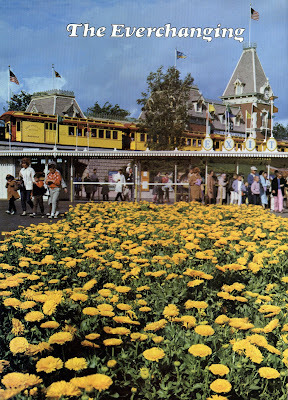 The cover to the Winter 1967 - Spring 1968 edition of Vacationland. 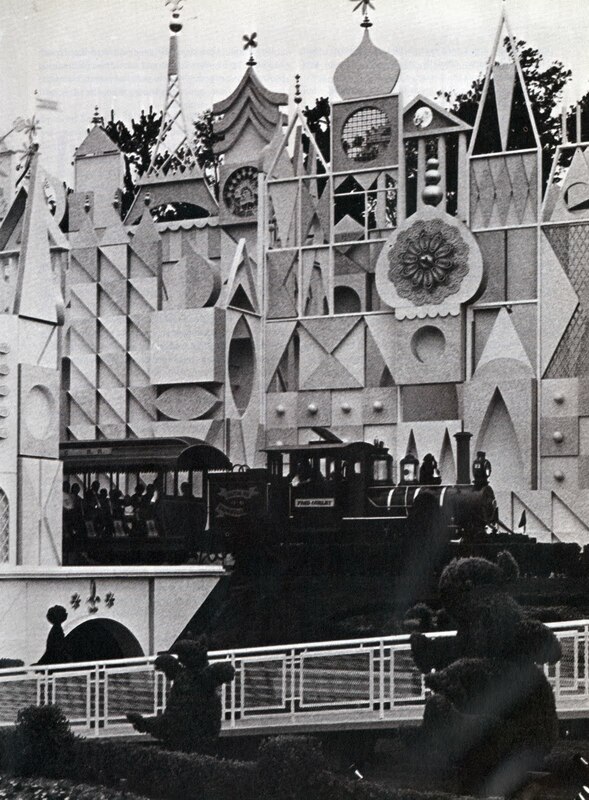 Notice anything wrong with this picture? 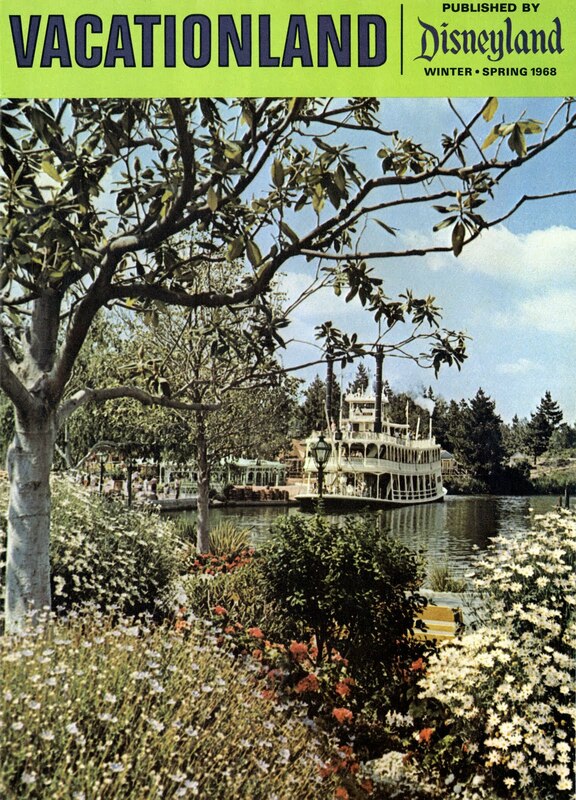 Here's a (clue). 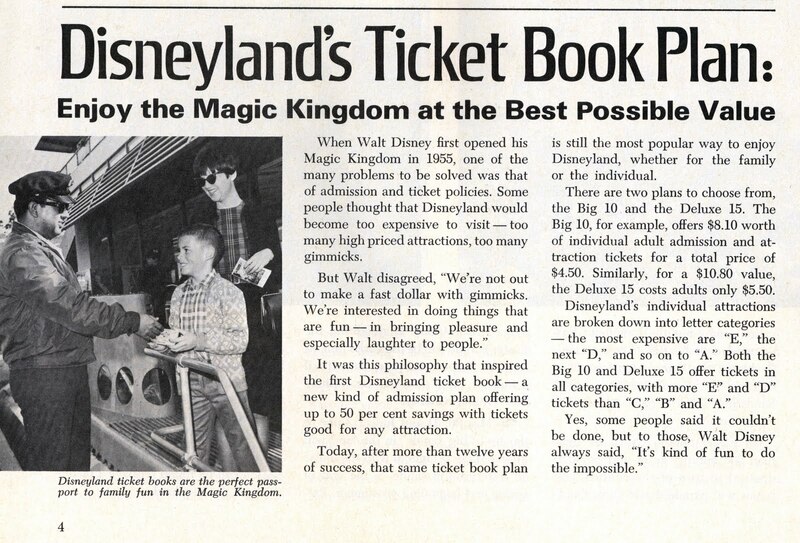 Nice article about the benefits of purchasing ticket books. 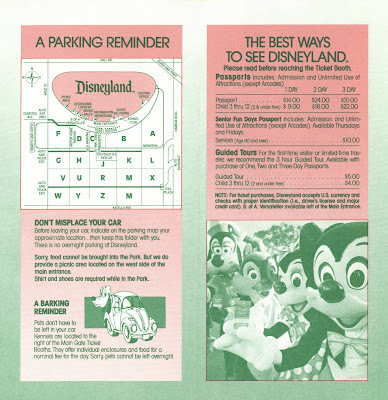 No mention of the fact that you probably won’t used them all and some weird guy on eBay will buy them from you decades later. 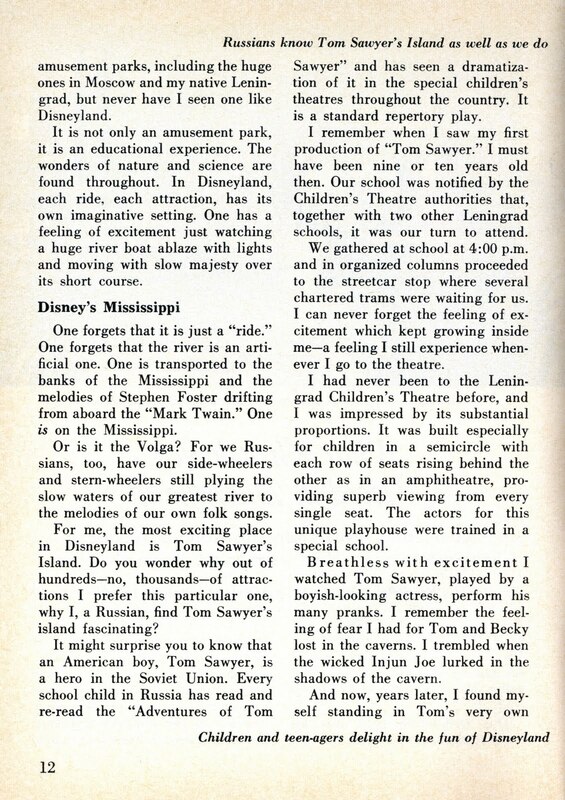 This article is entitle “The Everchanging Disneylandscape”, spell check doesn’t like that title and if you want to see the second page, come back on Bonus Sunday for the entire issue. This scan is dedicated to my friend “Katella Gate”, we both share an odd fondness for vintage Disneyland drinking fountains especially with sacks of sugar on them. 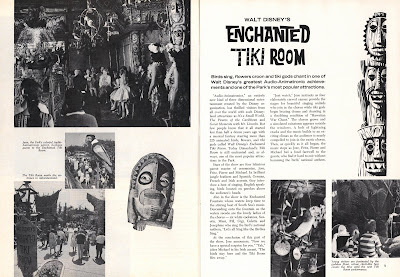 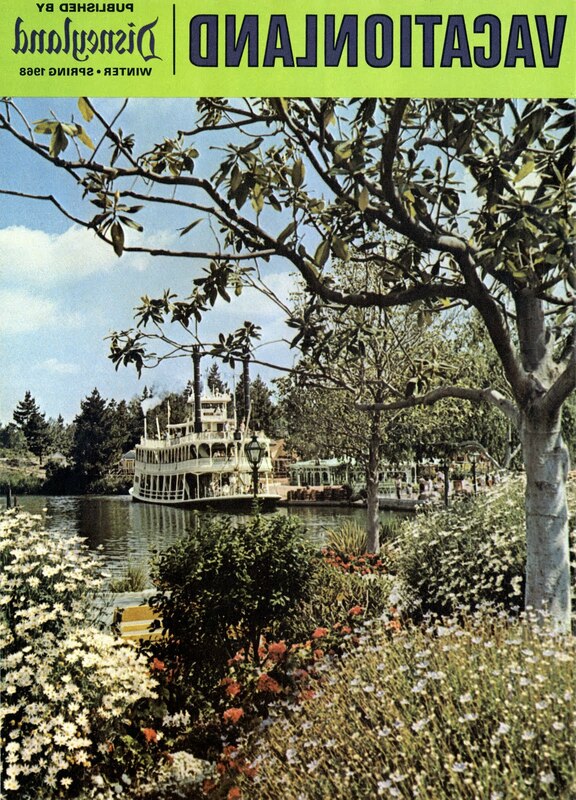 Come back on Bonus Sunday for the entire issue, its got articles about; "Spring has Sprung" with that weird hot air balloon at Disneyland, "Hollywood Tours" opens its doors, "The Enchanted Tiki Room" and "The Happiest Cleaners Work at Disneyland". 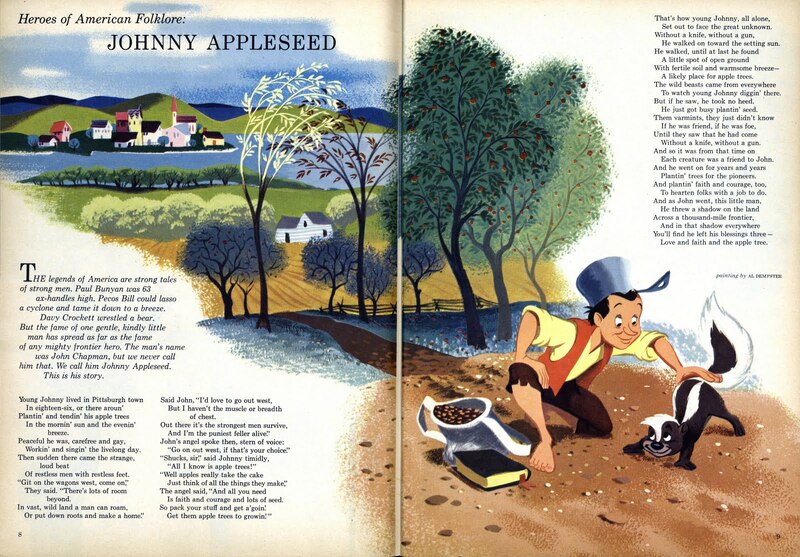 While not directly related to Thanksgiving, as hero of American Folklore, Johnny Appleseed certainly was a great American in the tradition of Paul Bunyan and Davy Crockett. 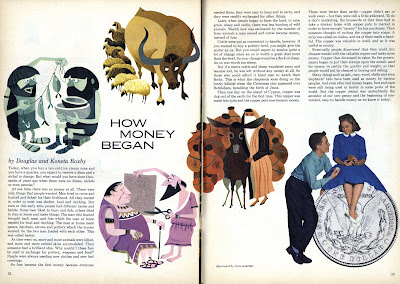 Al Dempster provides the excellent illustration; see the original art work over at Kevin Kidney’s Flickr site (link). 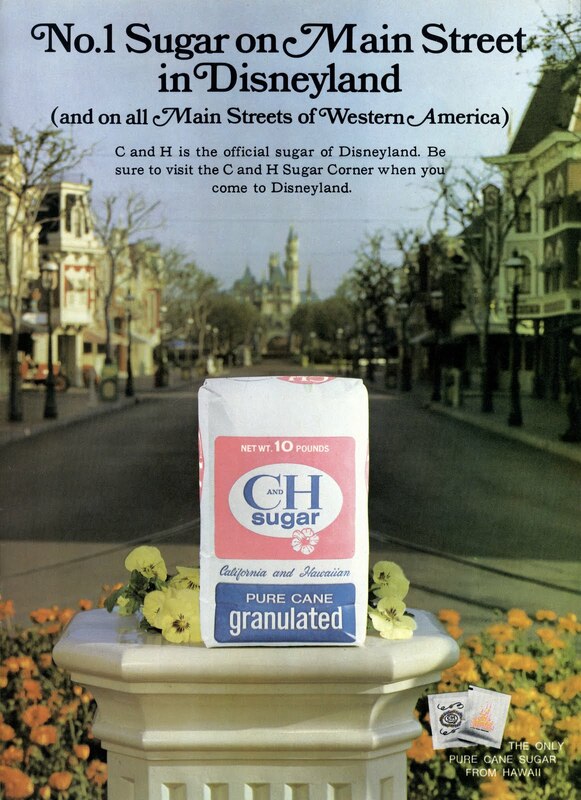 Where is the Carnation Delivery Truck today? 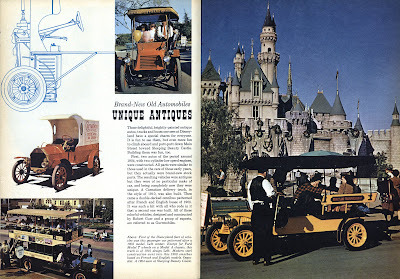 It appears to have been a working vehicle just like the rest of the Gurrmobiles, if they have it, they should run again. Here’s some wonderful Paul Hartley illustrations and an interesting article on how money began. 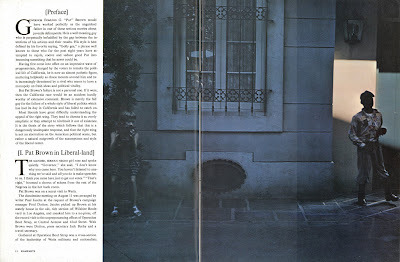 You can also see the original of this Paul Hartley beauty over at Kevin Kidney’s Flickr site (link). 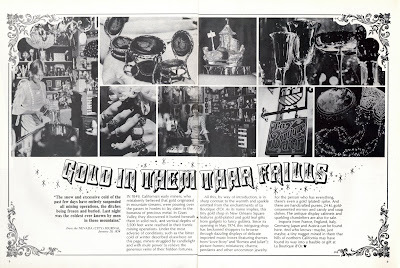 Lots of self promotion in this magazine. 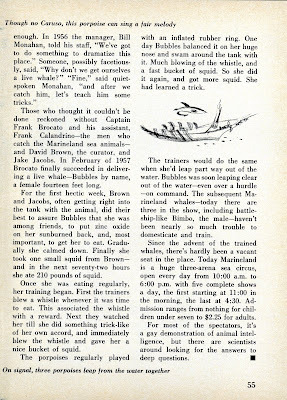 Why did they handle the subscriptions though New York? 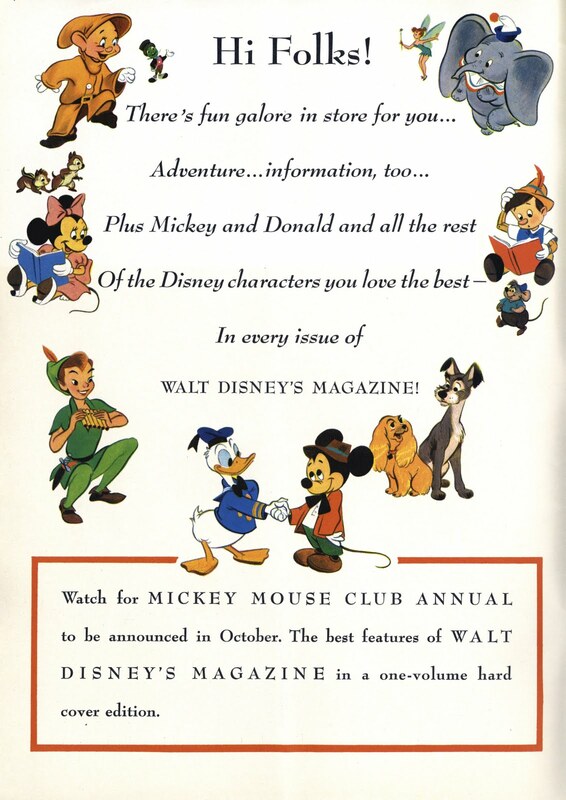 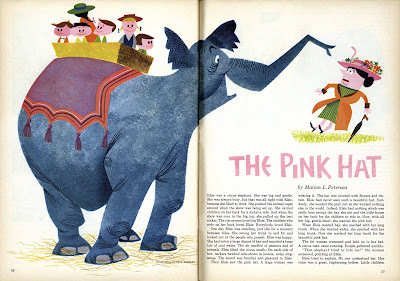 See my previous Walt Disney Magazine posts here (link). 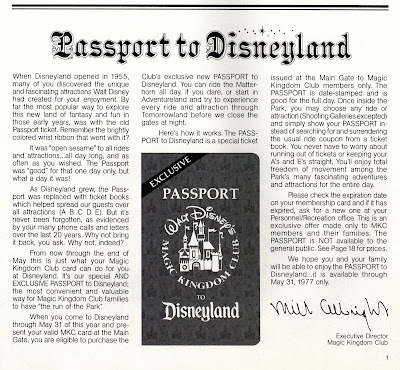 This article from the Spring 1977 edition of the Disney News explains the new “Exclusive” Passport to Disneyland (available only to Magic Kingdom Club Members). The article refers to some vintage passports that were “brightly colored wrist ribbons” has anyone ever seen one of those? 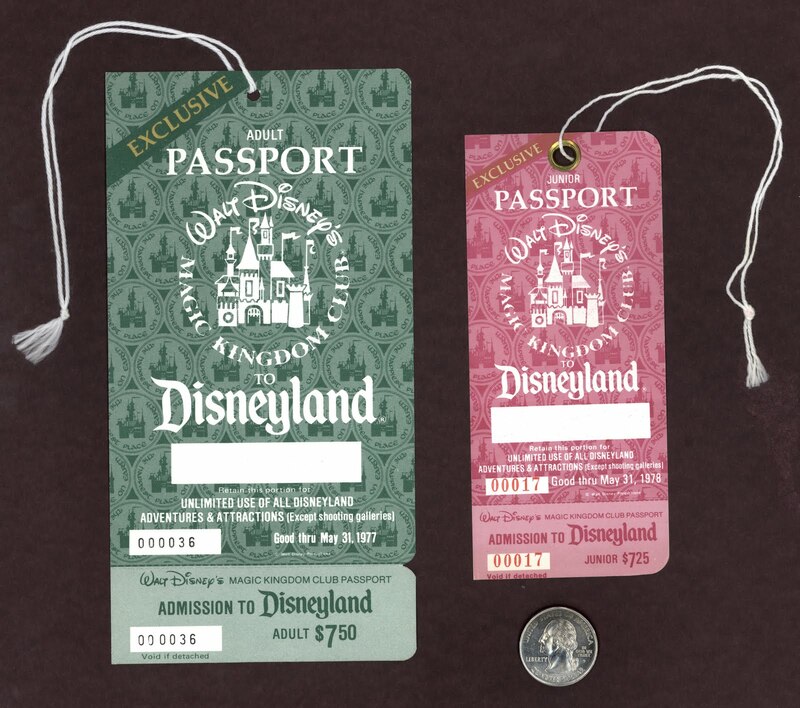 Here are two unused passports from the first run in 1977, just think of those unrealized happy memories. 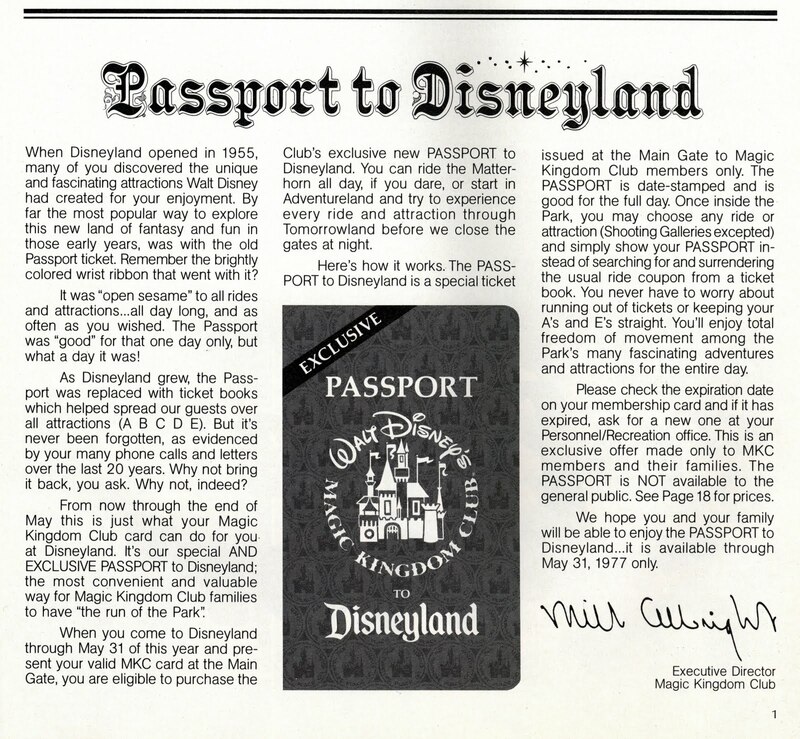 These Passports were only good until May 31, 1977, so forget about using them in the busy summer months and you’ve only got 4 days to use them for the new Space Mountain. 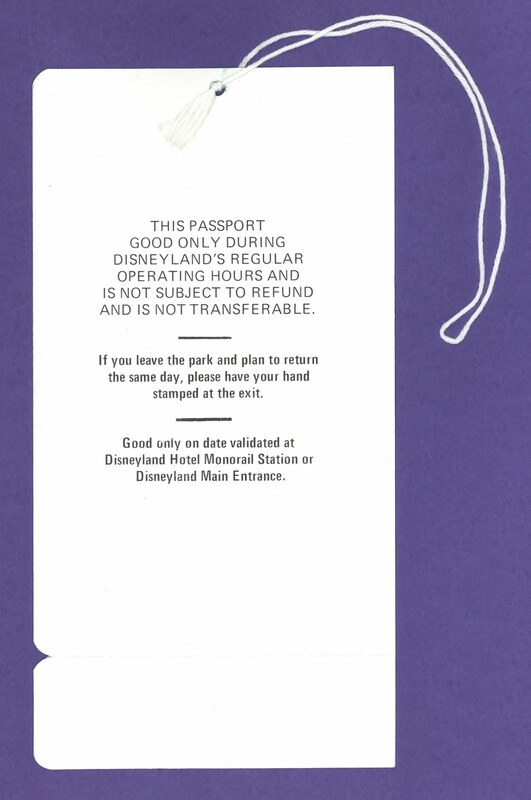 The basic disclaimers are on the back. 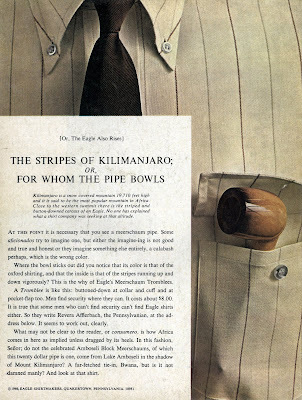 What if you have nowhere to tie the little string? The cover to the Spring 1977 edition of the Disney News. 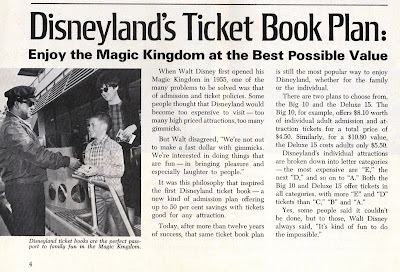 On page 18 you’ll find the prices for Disneyland and fun note about the up coming Space Mountain – is that Space Mountain font great or what? 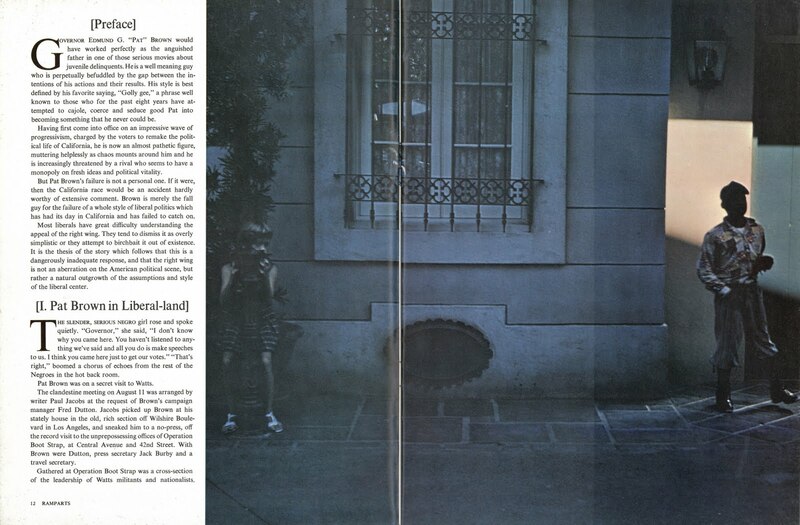 A nice two page article about the La Boutique d’Or in New Orleans Square. 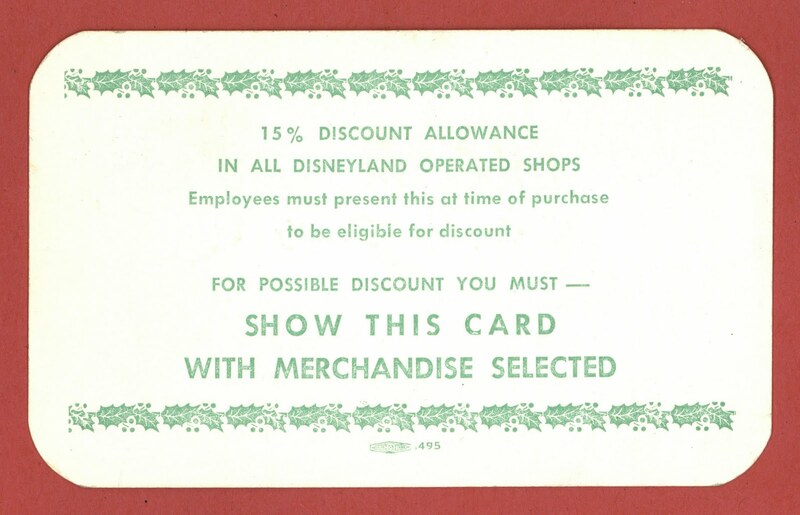 Is this shop still there? 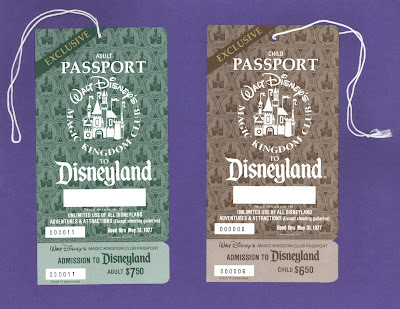 With 35+ visits to Disneyland in the past 2 years you’d think I would know this!! 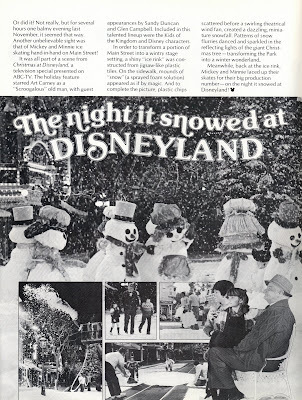 Artificial snow at Disneyland, like that’ll ever happen! 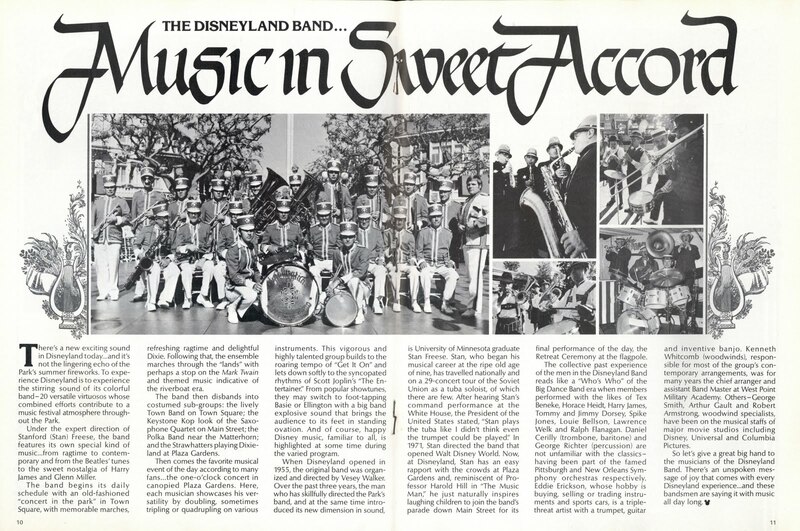 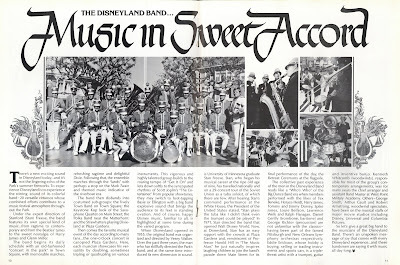 Possibly more than you ever wanted to know about the Disneyland Band. 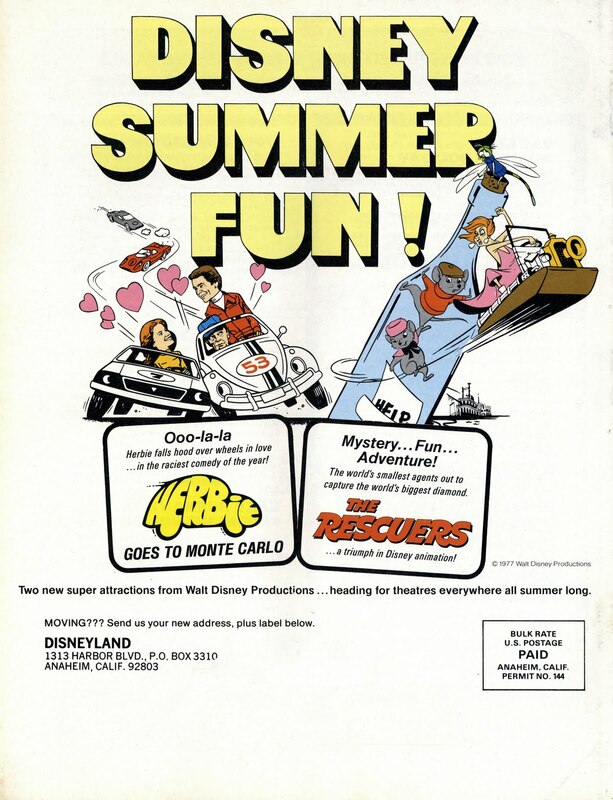 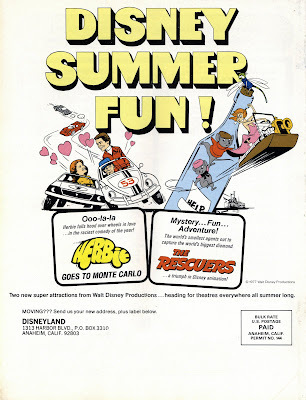 “Ooo-la-la” Herbie Goes to Monte Carlo, I remember waiting in line to see this in a theater that had only one screen, do they still have those? 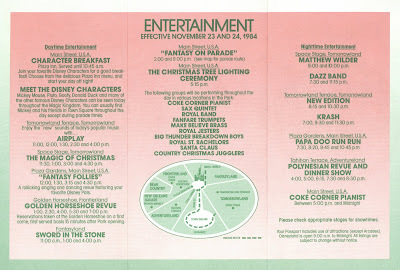 It's A Country Bear Christmas November 23 & 24 1984. 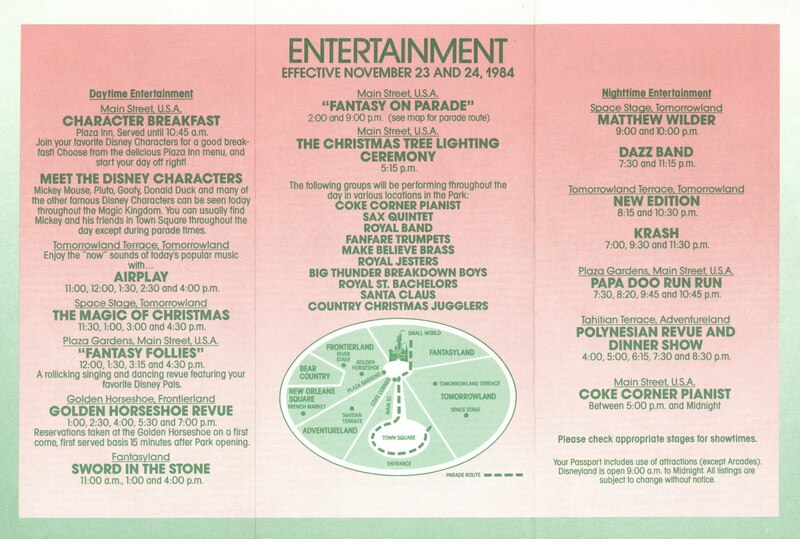 For the first year of the new Country Bear Christmas, they are featured on the cover of this flyer, but there is no mention of the bears anywhere in the flyer??? 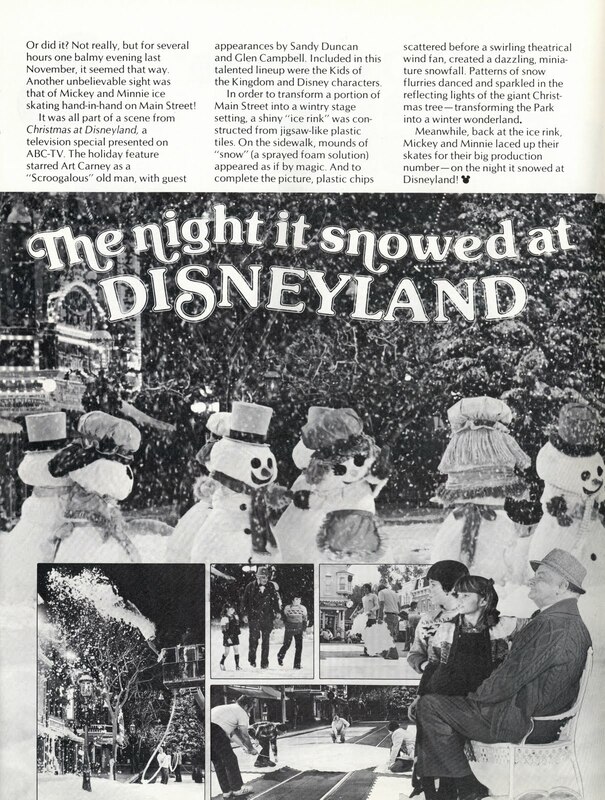 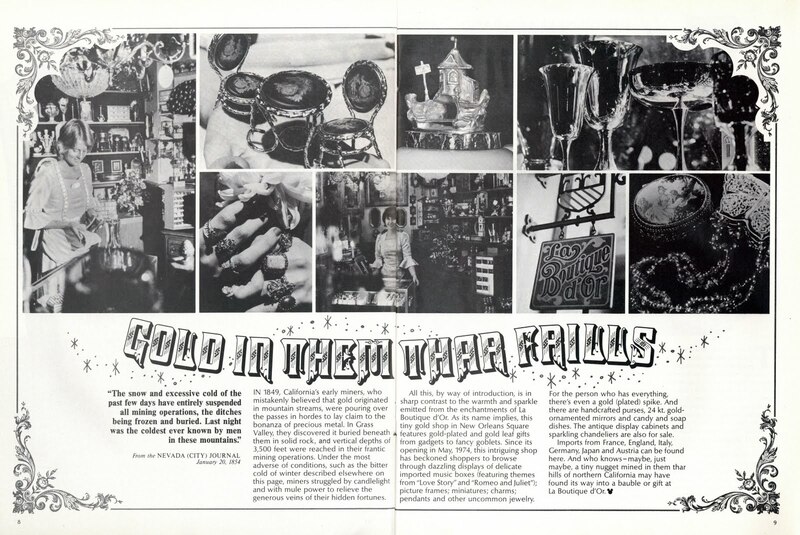 See a great L.A. Times ad for the same weekend in 1984 over at Meet the World (link). What's up with Matthew Wilder's hair?? 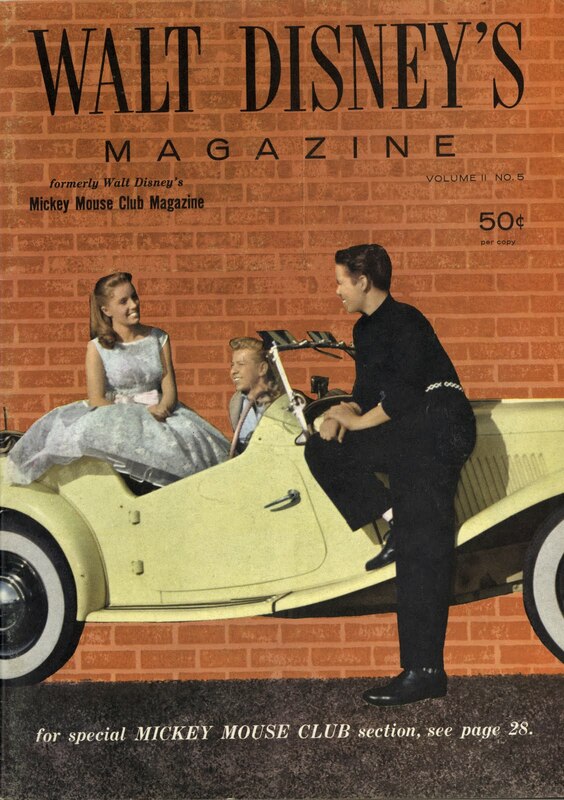 Welcome to Magazine Monday. Today we’ve got a second look at the Ford Times magazine. We first saw this “little” magazine with its September 1960 issue posted back in February (link). 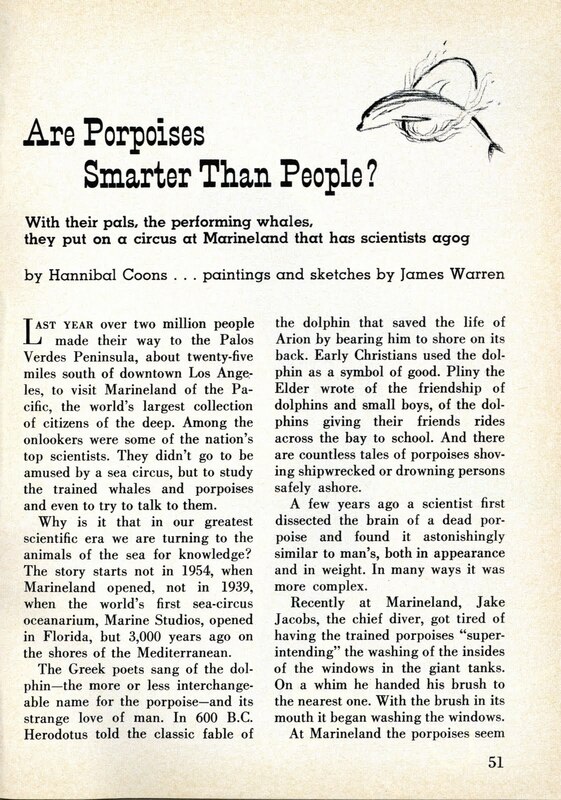 Today’s issue of the Ford Times is from May 1962. 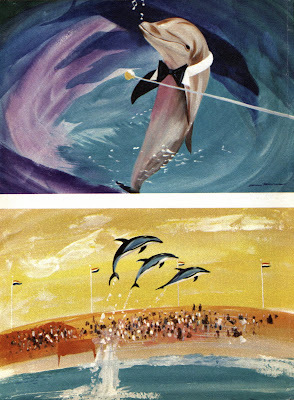 I hope you are ready to see 1962 through watercolors. The great cover painting is by Rex Brandt and shows the San Diego Harbor. 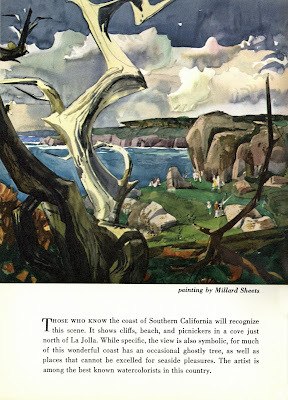 The inside cover has this beautiful watercolor painting by Millard Sheets. 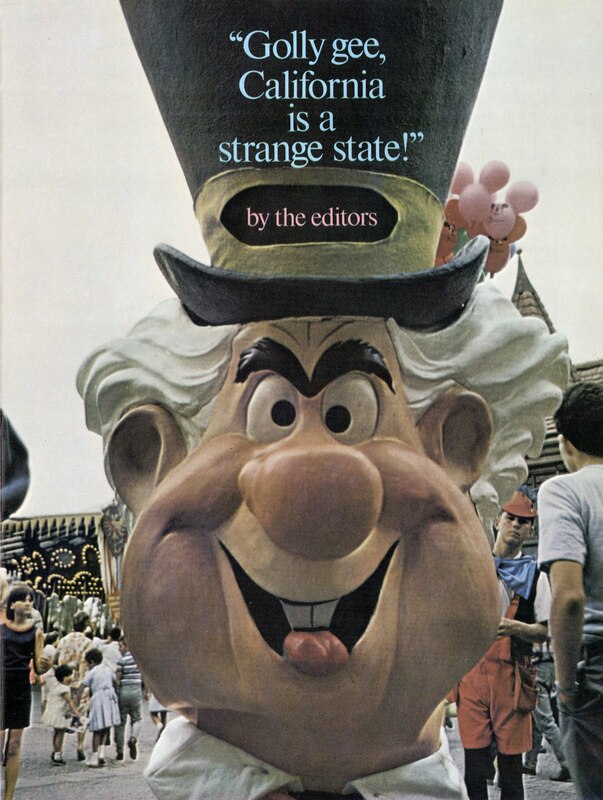 This issue's Disneyland article is fairly short, but certainly a reflection of the times. “What Khrushchev Missed in Disneyland”. 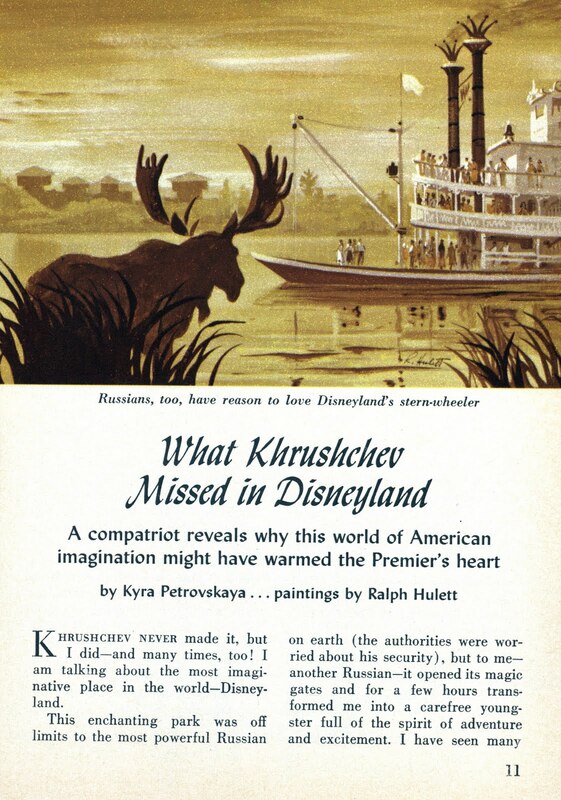 The article steers clear of exactly why Khrushchev missed going other than to blame “authorities” who were worried about his security. 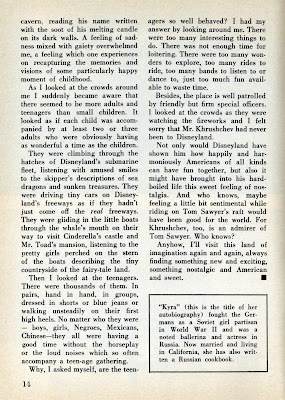 Kyra Petrovskaya (say that five times fast) tells about what Khrushchev would have seen from her Russian perspective. Turns out she and many other Russians are Tom Sawyer fans, I guess that’s why we get these excellent paintings of Tom’s Island by Ralph Hulett. Some interesting observations about more adults than children. 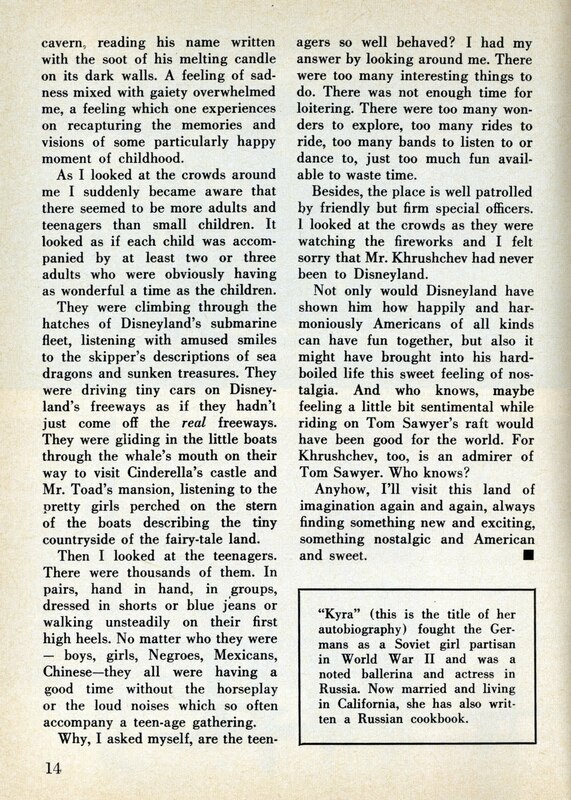 Possible political correctness violation where she describes the various types of the guests at Disneyland, again I suppose it was a sign of the times. 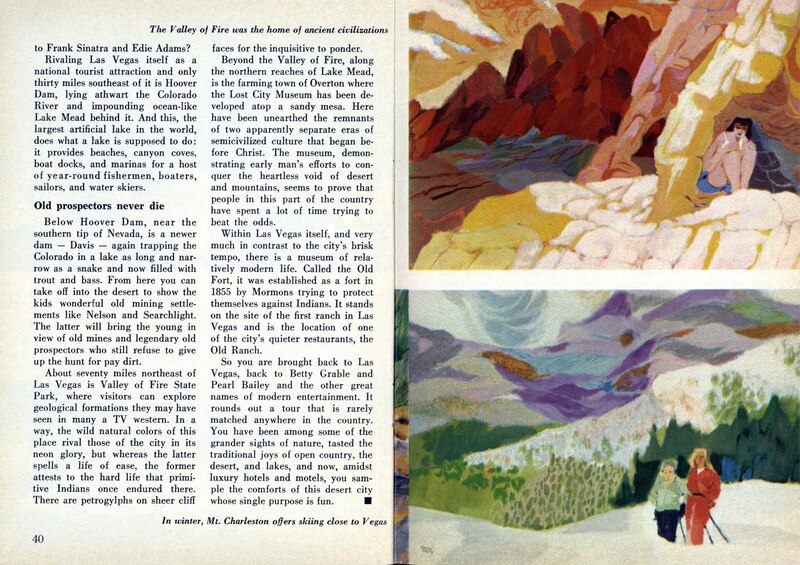 No advertisements in the Ford Times but there are a few more spectatular articles with more amazing art work. 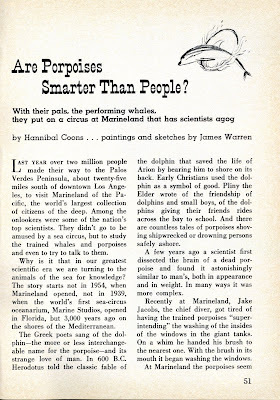 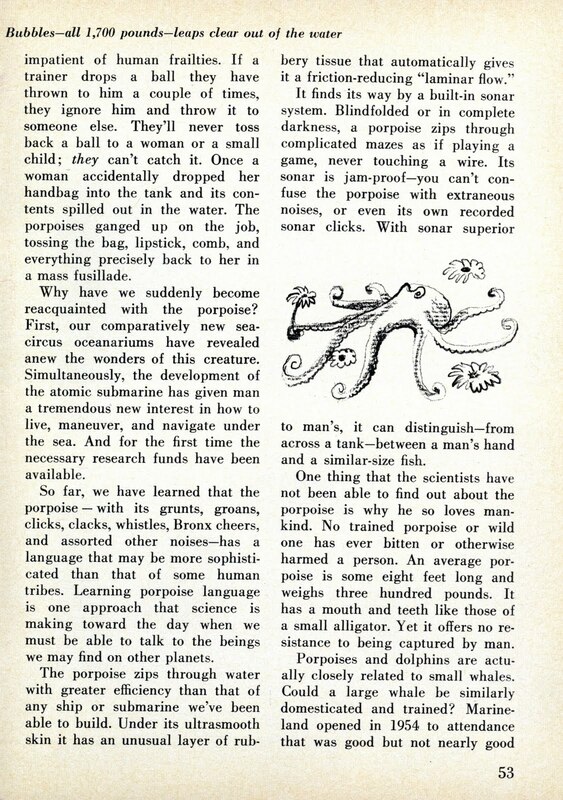 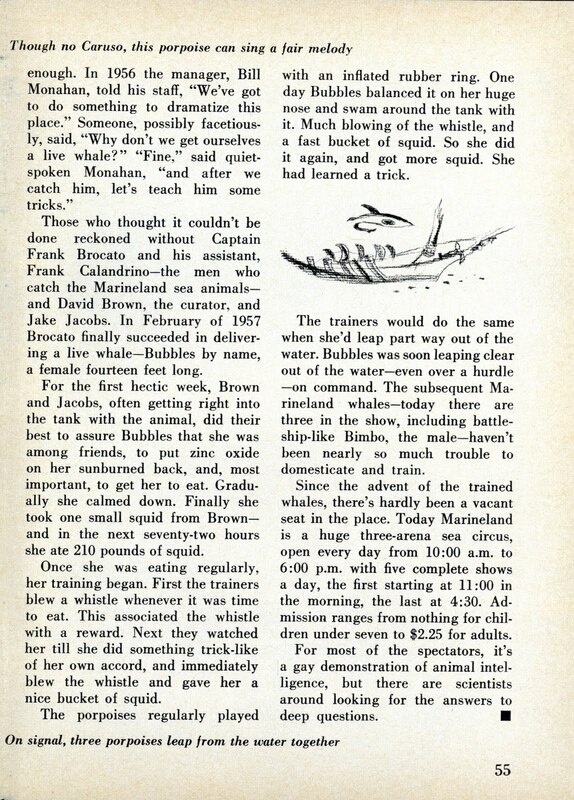 This 5 page article is about smart porpoises and Marineland! 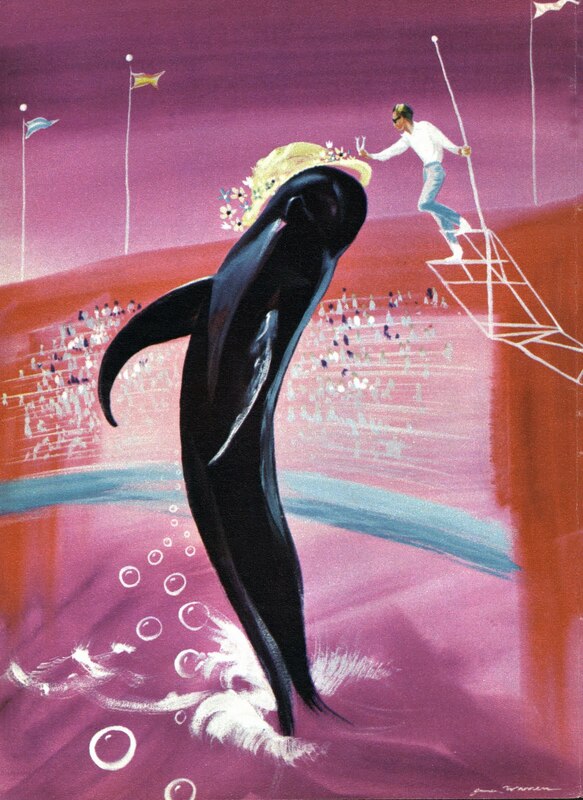 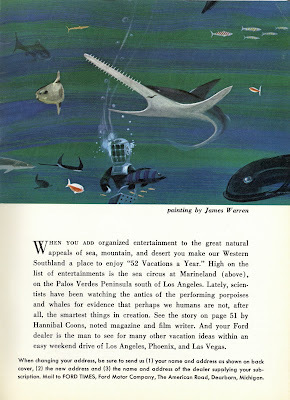 The paintings (and sketches) by James Warren really pickup the vibe of early Marineland. 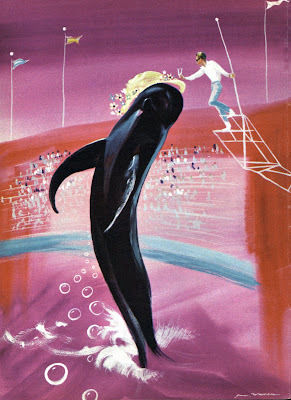 Flipper singing in a bow-tie! More Marineland goodness on the inside of the back cover. 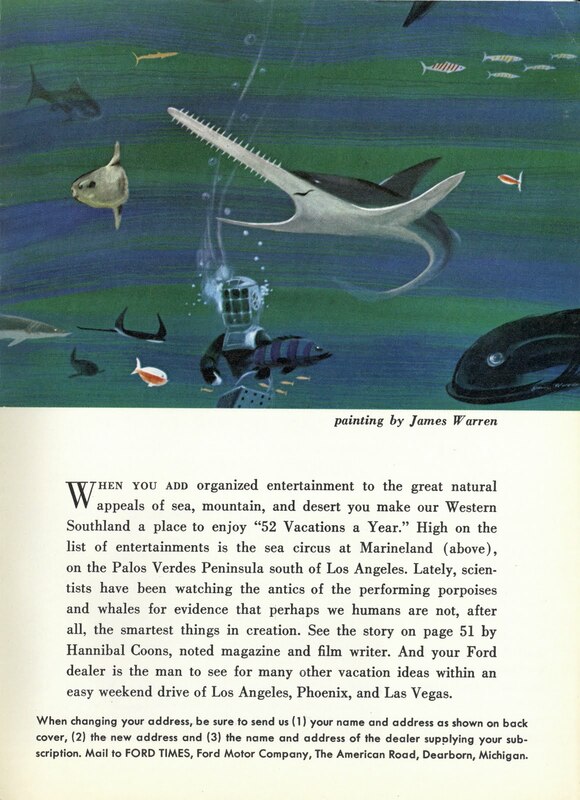 I can’t find anything about James Warren on the internet, too bad, I really like his style. 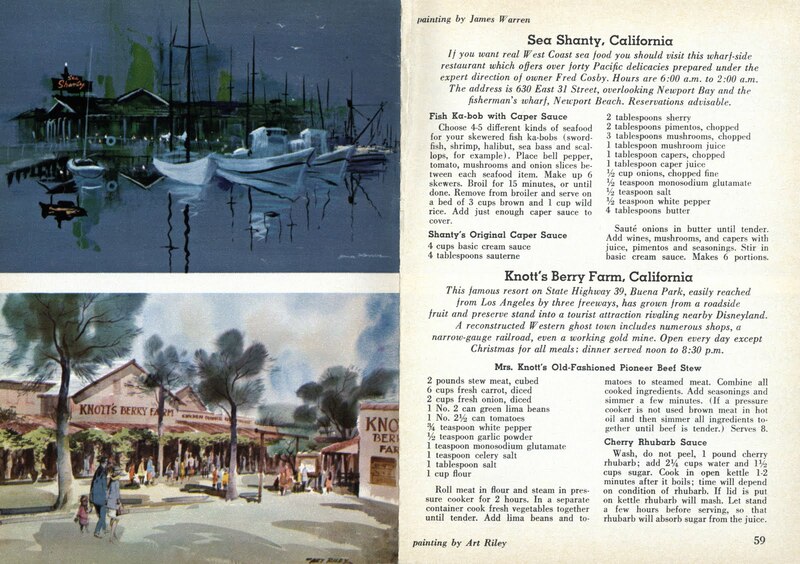 Knott’s Berry Farm didn’t want to get left out, here’s the secret recepe for Mrs. Knott’s Old-Fashion Pioneer Beef Stew. 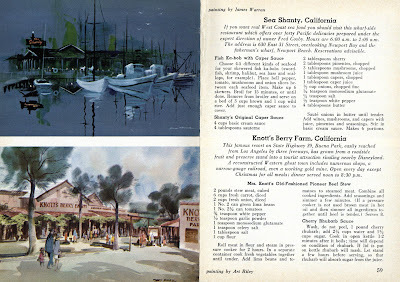 For you seafood folks, try the Fish Ka-bob with Caper Sauce from the Sea Shanty. 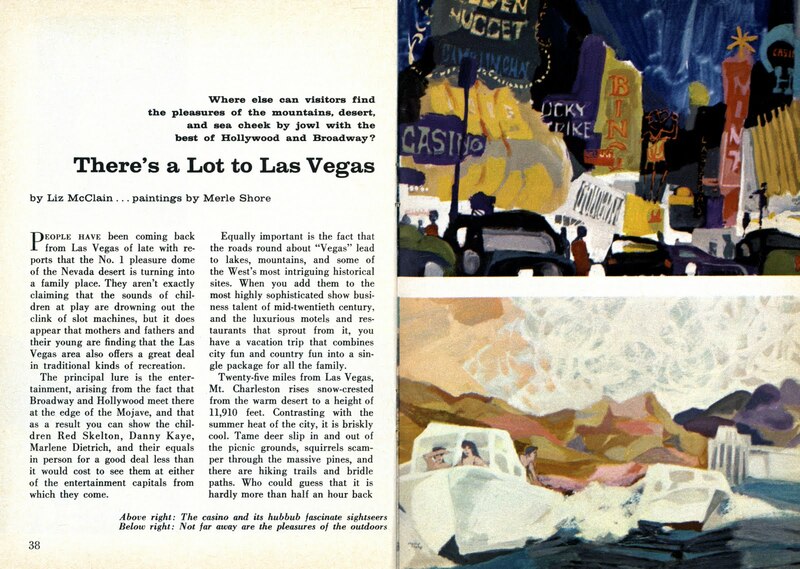 Red Skelton, Danny Kaye, Marlene Dietrich – you know “There’s a lot to Las Vegas”. Frank Sinatra and Edie Adams, did things that happened in Vegas stay in Vegas back in 1962? 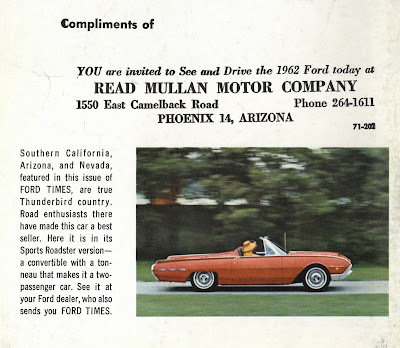 This post has been brought to you by me and is compliments of Read Mullan Motor Company, Phoenix 14, Arizona. 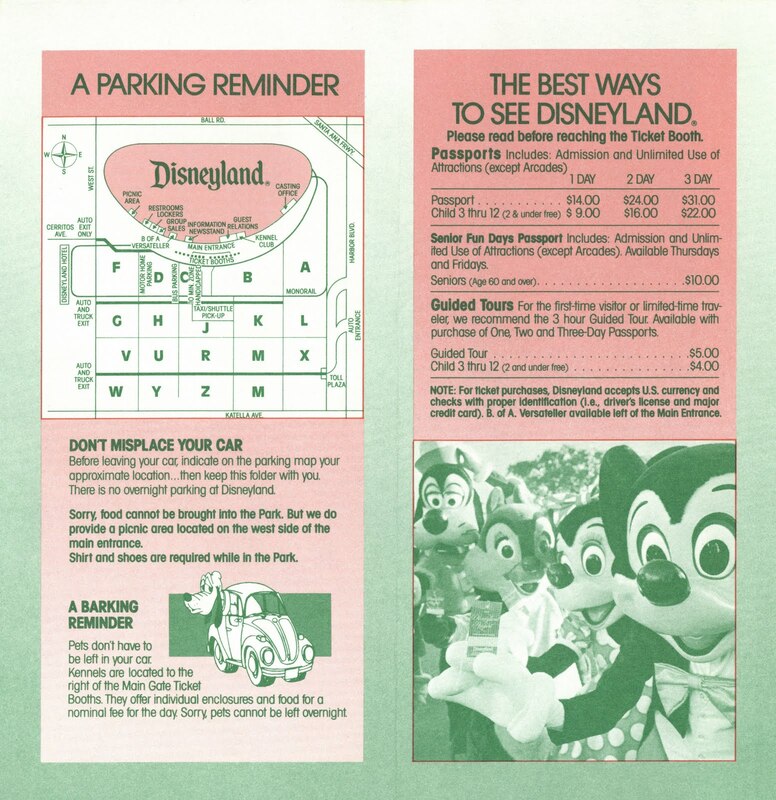 "Holy Grail of Disneyland Ticket Books"
1990's Disneyland Brochure - 2 year Anniversary!